“After a very long and difficult week of chess I had time to do a little reflection: Despite starting well at the Chicago Open, managing to beat 2 Grandmasters in the first 2 rounds, my tournament somehow fell apart around the middle. I realize that at the end of the day that I and only I am responsible for the result that I had, however there were two incidents in particular that I felt affected my performance. During my round 4 game with IM Akshat Chandra I was accused of cheating by him and his father no more than four (!) times during the same game. The first complaint was apparently by Akshat which I put to rest, however his father kept repeatedly making the same claims that I was cheating in some way. There is a very simple explanation for all this, as many of my colleagues know I have a bad habit of smoking. During the game I was drinking coffee as well so I ended up using the bathroom a bit more than usual as well. Followed to the bathroom by the tournament director, no electronic devices were found on my person. In fact, this was a day where I had forgotten my cell phone at home! I understand the right to complain of supposedly suspicious behavior, but to complain as many times as my opponent’s father did, especially for someone who is not playing the game, should be considered harassment. Especially on account of the lack of evidence each time a tournament director confronted me (no electronic devices, smoking within view of people etc). This harassment had a very clear effect on me as the repeated accusations had clouded my thinking and I ended up blowing a winning position, finishing with a draw. This got me thinking that claims for cheating should be made solely by the opponents or tournament participants/directors as well as there being some sort of consequences for repeated accusations which have no base (once again, harassment). Gopal is right that I brought his unusual behavior to the Tournament Director (TD) / Arbiter’s attention. But he is wrong on pretty much everything else. Here’s what my father informed me and I paraphrase here. My father – “It appears to me that Gopal completely missed out the 10 – 15 minutes of security protocol lecture from the tournament organizers. The emphasis on anti-cheating measures was the strongest at any CCA tournament thus far, and the lecture so detailed and lengthy that it delayed the round by about 15 minutes. Gopal seems to have missed it all, which could very well be since he arrived late to the table. In the lecture, the TDs were very clear about what is acceptable and what is unusual behavior, and the importance of not having any devices on person in the restroom. They designated an official restroom and the official playing area, which was the playing hall and the narrow strip in-front of the entrance door, the official bathroom and the analysis room. The Chief TD mentioned explicitly that anyone who leaves the playing area during an ongoing game to go to the far away restroom or to hotel reception area or outside the hotel will be a person of interest for TDs and will have a greater chance of inviting a scan with the cell phone wand (detector). If a cell phone is found, the game will be forfeited (for the Open section, and other penalties for non-FIDE sections). 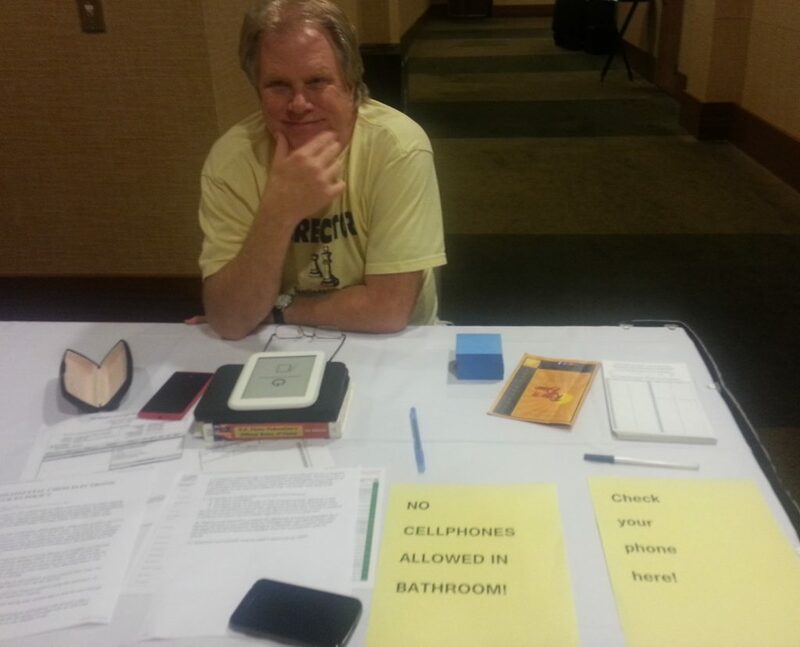 Outside the official restroom, the organizers provided a desk to deposit any devices before entering the restroom. Gopal repeatedly left the playing hall for a number of minutes during a few moves, and his continued lengthy absence often on immediate moves was considered unusual by my son. Akshat mentioned this unusual behavior to the TD inside the hall saying that “My opponent (Gopal) isn’t probably doing anything wrong, but his behavior is unusual and so I thought I’ll tell you guys just to be sure.” He never said to the TD that Gopal is cheating. But like any other player, if you see something unusual, you must say something during the game, and that’s what Akshat did. The TD told Akshat that they will be watchful. I informed the TD outside the hall who was monitoring players leaving the playing area. He simply asked me the Table # and told me that the player must inform any of the TDs inside, which Akshat had already done. At that time Gopal was leaving the playing area and the TD knew who I was talking about. That was the only one time I spoke to the TDs. I never spoke to them again. So when Gopal continues to say that I complained 4 times to the TD, he is simply assuming and not realizing that the TD’s interest was raised because of his activities. As Gopal himself mentioned that he kept leaving the playing hall for various reasons. It’s clear that any subsequent interest shown in him by the TDs was because he was leaving the Playing Area repeatedly – whether going outside for a smoke or going to the far away restroom instead of the official one. That was exactly what the organizers/Arbiter had informed the players will invite additional scrutiny and the cell phone scan. But it’s obvious that Gopal had missed all those instructions by arriving late for the game. To me this appears like a self-inflicted problem. Of course, Gopal must have been annoyed because during the game he bumped me hard on the way to his board while I was observing some games. So that’s my father’s account. It’s important to clarify such a misunderstanding. I wish Gopal would have brought it up in the Analysis room during our post-game review. The fact that he was scanned several times had nothing to do with me or my father. Arbiters don’t take too kindly to intervention by non-players. It was due to Gopal’s own repeated exit of the Playing Area. Hope he realizes that now. Gopal is a very good chess player who is underrated. Good luck to him.